Harbor freight had some clamps on sale, $2.99 for 6in, $4.49 for 18in so I decided at that price I didn’t have anything to lose. I bought 10 6in and a few 18in. I wanted the 20in too but they were on back order. They came in the other day and I am very impressed. I have alot of the bessy F clamps and these actually seem to be heavier duty. They are machined great, look great, and they meet perfectly in center. They look just like the pic http://www.harborfreight.com/6-inch-bar-clamp-96210.html I have checked some of the cheapos out at other stores that seemed met way off center. And ordered some online that look good in the pic but don’t look like they were made by a kindergardener once I get them. They also have rubber on the handles which make them much easier to tighten. I will definately be buying more of these as the need arises. Can you put a lot of clamping pressure on them? I broke two of the harbor freight plastic quick clamps before swearing them off forever. These look a little better. I have a few of these too. Great clamps for the money. You can tighten them pretty far without problems. Rubber pads fall off easy, and the bar tends to rust a little, so just remember to wax up. There is a lot of play from side to side. I my opinion they are good for clamping stuff that do not require precision. The plastic ones are only good for light pressure IMHO. I have some of the 6” metal and have had no problems(use them all the time) I would suggest a dab of hot glue on the pads to keep them from falling off. These are one of the gems at HF. Yes, some handles will come off, think epoxy! Yes, they do flex, but unless you spend big bucks, what clamps won’t. If you are just starting to amass a clamp collection and need to add a lot of clamps to the arsenal, these are a great way to go. I agree, these are really good clamps, regardless of price. I use the 36” clamps quite often and I’ve had no issues with them. I have a few of these and I must say, they are excellent. Never fail. When HF puts these on sale I run to pick up some more because they sell out quickly! Haven’t had a bad clamp yet! I agree with DIYaholic that this is one of the few HF gems. 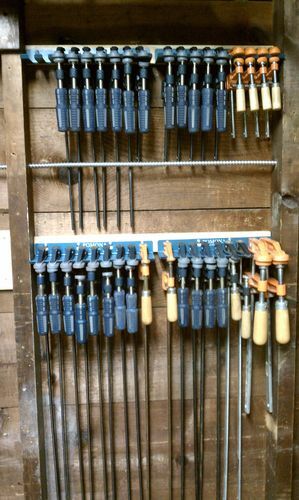 I stocked up on them earlier this year and have used the 6” and 12” many times now for my projects. I had initially bought a few across their whole range, but noticed that the bar on many of the longer lengths bow. Eventually I returned the 30” and 36” in favor of more 6” and 12”, which I can’t seem to have enough of. My wife also found excellent uses for the 6” clamps as make-shift baby-proofing, to lock down a few sliding doors in our furniture. There’s certainly enough pressure to keep a baby from opening the door. I have a few of these. For me, they work great. Be picky! Wait for a sale and browse through all of them on the rack to get the ones that line up and work best. Cheap or not can anyone EVER have enough clamps???? thanks for the review,i’ve been needing some 6” clamps and these sound great.reasonable price and they work also,you just can’t beat it. I’ve had great luck with these inexpensive clamps. There are probably 12-18 of them in my shop. These are much better than the black and orange quick grip type that HF offers. Nice review. I agree with most, these are a gem, I think I picked up a few for $1 at a big sale, a few more $2-3. Wish now I would have bought the store when they were that price. I have a bunch of Jorgensen clamps and the wooden screw handles give me blisters tightening them, but these rubber ones are so much easier on the hands.